As a result of human activity, Earth's climate has changed considerably since the beginning of industrialization. Consequences are, for example, global warming, the decline in ice cover and sea level rise. However, significant natural climate variations have occurred in the past as well. These include the coming and going of ice ages and abrupt changes between warmer and colder centuries during the last ice age. The cause of these climate variations is the Earth system's non-linear response to relatively small changes in solar radiation. Simulating these significant climate variations with complex Earth system models will help to better understand the long-term dynamics of our climate in order to allow a better assessment of possible long-term climate trends in the future. The Max Planck Institute for Meteorology (MPI-M) plays a leading role within the PalMod project (Paleo Modelling), which involves 18 scientific institutions, aiming to study the climate system and its variability during the last glacial cycle using complex Earth system models. 20,000 years ago, the average global temperature was about four to five degrees colder than today. North America and Scandinavia used to be covered with gigantic ice sheets and the sea level was by about 120 m lower than today. Compared to the pre-industrial value, the atmospheric CO2-concentration was more than a third lower. The massive ice sheets have disappeared within 10,000 years and the climate got warmer. Now, scientists want to find answers to the following important questions: Which processes have dominated the quick disintegration of the ice sheets which has happened in fast surges? How can the rise in atmospheric CO2 be explained and how quickly can the global carbon cycle, and thus the atmospheric CO2 and methane concentration, shift in response to other rapid climate changes? So far, studies of long-time climate variability have been performed with simplified climate models and Earth System Models of Intermediate Complexity (EMICs). The simplified climate models rather serve the conceptual understanding of climate dynamics and are not suitable for predicting long-term climate variability. EMICs, on the other hand, can in principle project long-term processes, but rapid changes in the climate system, such as the weather, are not being explicitly calculated. Only the effect of rapid changes on slower climate changes is either represented in total or is parameterized. Yet, it would be interesting to directly describe the interaction between rapid and slow climate fluctuations directly in a model. On the one hand the slow climate system components, such as the ocean and ice sheets, characterize the movement of rapid climate system components, such as the atmosphere and sea ice. On the other hand rapid climate fluctuations influence slow climate changes. In addition to possible deterministic feedbacks, random weather fluctuations can also grow into a climate anomaly causing a temperature anomaly in the ocean, which in turn can last significantly longer than the original weather fluctuations due to the memory function of the ocean. This process has already been described by Professor Klaus Hasselmann, founding director of the MPI-M, in the seventies (Hasselmann, Tellus 28, 1976). Interestingly enough, slow climate fluctuations on a time scale of more than 100 years and rapid climate fluctuations seem to follow their own laws. The spectra of temperature fluctuations, for instance, show different scaling characteristics. However, the two spectral ranges are not separated from one another, but slow and rapid temperature fluctuations are of the same order of magnitude at a time period of around 100 years. This suggests that slow and rapid climate fluctuations interact directly. The understanding of this interaction will allow climate scientists to provide reliable estimates of climate change in the next centuries. In order to directly calculate the transition from weather to long term climate fluctuations of many centuries and millennia presents a major challenge to climate modelers. So far, simulations with complex climate models have only been performed for a time range of several centuries, only in very few cases for a couple of millennia. For longer calculations, the models will have to be made significantly faster. New algorithms need to be developed. However, not only high technical demands are made on the development of complex Earth system models. The models are still lacking potentially important physical and biogeochemical processes. Ice sheets, with their long timescales, are constant by default in conventional simulations. On very long time scales, the variability is amplified by the means of interactive coupling with dynamic ice sheet models which permits the study of feedbacks between continental ice masses and large-scale ocean circulations in the Earth system models. In addition, current models are lacking important interaction processes of the global carbon cycle, the sea level and ice sheets, which may explain the rapid and asynchronous changes in atmospheric carbon dioxide and methane during abrupt climate changes. The effect of carbon and methane being stored in permafrost on land and as a gas hydrate in marine sediments, which amplifies the climate variability depending on Earth´s orbit, is not included in Earth system models yet. PalMod is supposed to close these gaps in knowledge and modeling. The results of the model studies will allow to estimate the robustness of long-term climate projections and to improve the validity of future climate simulations accordingly. In the first, four-year project phase, the climate change of the last 20,000 years will be analyzed starting with the peak of the last ice age up to the present warm phase. To do so, the Earth system model of MPI-M (MPI-ESM 1.2) was coupled at a very coarse horizontal resolution (up to 400 km wide model grid cells) to an ice sheet model (20 km resolution). The model quality is currently tested on the basis of the simulation and reconstruction of the peak of the last glacial maximum. Further model components necessary for long-term simulations will be added in the future. A particular challenge is the integration of modules able to represent the dynamics of permafrost, peat formation, carbon conversion in peat, methane emissions from wetlands, the relocation of rivers by changing sea levels and the formation of ice sheets. Parallel to the model development, model simulations covering the last 8,000 years, the current warm period of the Holocene, will be performed with the MPI-ESM 1.2 at a finer horizontal resolution (200 km wide model grid cells) . The focus is on the analysis of terrestrial and oceanic components in the global carbon cycle and the dynamics of vegetation cover, especially of the Sahara, which was significantly greener at the beginning of the Holocene. PalMod helps not only to understand the dynamics of the large ice sheets and terrestrial and marine carbon, but also to advance the development of the new Earth system model MPI-ESM 2. Fig. 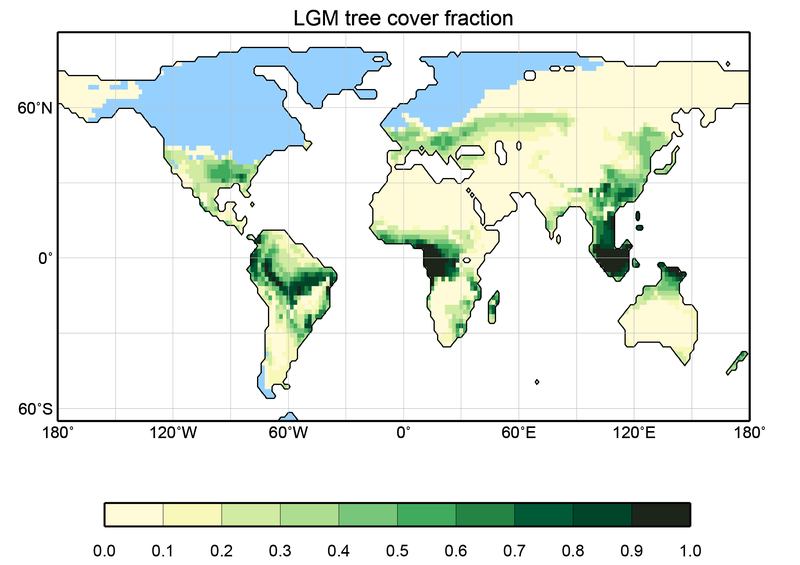 : Tree cover fraction simulated by MPI-ESM 1.2-LR for the Last Glacial Maximum. The project is funded by the German Federal Ministry of Education and Research (BMBF). In addition to researchers from the MPI-M, sixteen German research groups as well as a Canadian group are involved. PalMod has been set up to be run over a period of 10 years and to achieve its research goals in three project phases. Phase I started in August 2015 and ends in July 2019. Professor Martin Claussen is one of the three principle investigators of PalMod, along with Professor Mojib Latif (GEOMAR, Kiel) and Professor Michael Schulz (MARUM, Bremen). Together with Professor Victor Brovkin (MPI-M) and six other scientists, they form the PalMod steering group. Further participating MPI-M scientists: Anne Dallmeyer, Mathias Heinze, Tatiana Ilyina, Marie Kapsch, Thomas Kleinen, Virna Meccia, Uwe Mikolajewicz, Thomas Riddick und Florian Ziemen.